Something happens every January where I get really inspired. I know that it has something to do with the New Year and the reflection that comes with the end of a year, and the start of a new one. I know I mentioned a lot of my resolutions this year like losing weight, making this blog into a .com, and moving, but I have a lot of smaller resolutions as well. One of my smaller ones that I didn’t mention was to revamp my nail polish collection. I want to first sell some of the polishes that I don’t like and won’t wear again. I also want to take the time and swatch all of my older polishes that I’ve never featured on here before. I was thinking about a new series inspired by an Instragram hash tag called Throw Back Thursday, where I wear an older polish in my collection. I’m looking for a little feedback from you guys before I begin that series, so please let me know if you would be interested in seeing those polishes. But today, I’m going to show you a newer polish to my stash, another beauty from Quo by Orly. Quo “Night Sky” is kind of a complex polish. Its a darkened purple base, almost a black base with heavy purple shimmer. 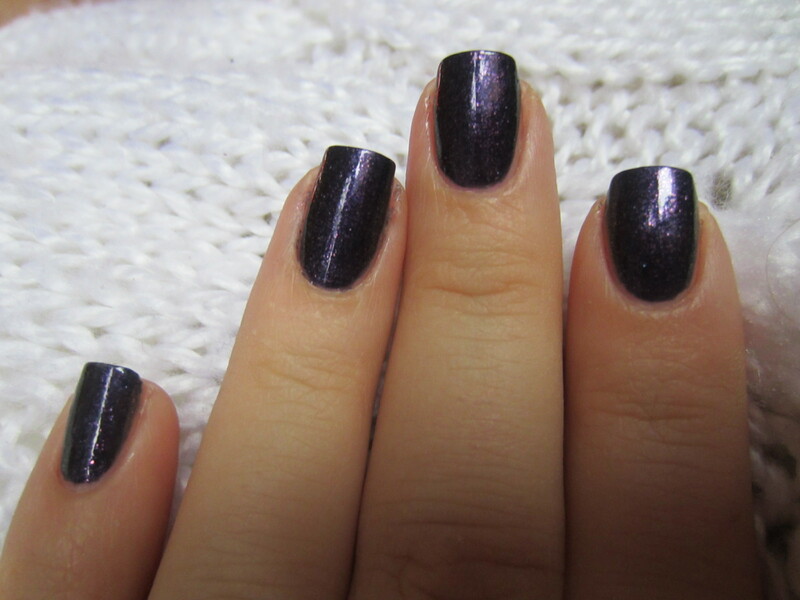 The polish almost looks like a black and purple glass fleck, but its just super saturated with chunky shimmer. In the bottle, this polish looks like a strong glass fleck duochrome that shimmers from dark purple to gold to pink. However, the gold and pink don’t translate on the nail. The formula on this polish was really nice. It wasn’t anything spectacular to write about, but it was opaque in 2 coats, covered the nail evenly and the dry time was average. The consistency of this polish wasn’t too thick or thin, and was really easy to control. Overall, it was a really nice polish! If you’re a fan of dark purples or dark shimmers, this polish might be right up your alley! What do you guys think? Do any of you have any Quo polishes? What are your favorites? And what do you think of my Throw Back Thursday series idea? Hi. Very nice polish. I’ve never heard about QUO by Orly before. I’ll google search to check it out. Thank you. Please, carry on with your new series about older polishes of yours. It sounds great to me! But, you know, I’m a fan of yours….because your videos and reviews are always to the point. awww thanks girl! i’m filming one tomorrow actually so hopefully i won’t disappoint!